Old Courthouse Theatre, Inc. announced this week that it is celebrating its fifth and sixth sellouts of the 2016 – 2017 season. The Sunday December 11, 2016, and Sunday December 18, 2016 performances of A Broadway Christmas Carol, created by Kathy Feininger, are officially sold out. Tickets are still available for the Friday December 9 and 16, as well as the Saturday performances on December 10 and December 17, although those tickets are going quickly as well. with all the characters played by just four actors and parodies of many popular Broadway songs interspersed throughout the play. 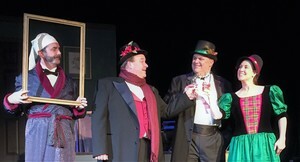 Tickets for A Broadway Christmas Carol may be purchased online at www.showtix4u.com, or calling the OCT Box Office at 704-788-2405. Volunteer opportunities are available by calling 704-788-2405 or email volunteers@oldcourthousetheatre.org.